I don’t fully understand why people lie, why they are so afraid of the truth. I continue to become more and more a fan of it. The more I write this blog, the more I am beginning to see that truth is just another word for reality. If something is true, then it is real. If it is true, it is reality. Hiding from the truth or not speaking the truth is simply rejecting reality. It’s hard to think of something more foolhardy than rejecting reality. Reality simply is what is. No more, no less. No judgment, no confusion. No equivocation. No waffling, To reject whatever is is a losing proposition. We can wish things were different and can work to change them, but reality remains exactly as it is. The more aligned we become with the truth (and by aligned, I mean comfortable with it and accepting of it as a way of life) the less there is fear of speaking and living it. If I speak or act out my truth, and someone gets angry with me or rejects me, their anger or rejection is also true, is also reality. It is simply what is. To be afraid of the fallout of our truth driven words or actions means that somehow we are not fully accepting of reality as it unfolds. We want “nice nice” reality.” We are welcoming of reality only if it comes in the flavor or flavors that we like. Mmmm, Pistachio Truth. Yuck, Rocky Road Reality. Rejecting certain flavors of reality is akin to rejecting the rate of speed at which the Earth is spinning, or the time at which the sun is setting. It is folly. I think there may be a narcissistic tendency which makes us skirt the truth. There is a part in most all of us that wants things our way, want’s everything to be exactly as we want it. Not only do we want everything our way, but we feel we are entitled to it. Since others don’t necessarily see our “deservingness of everything,” we end up avoiding telling others the truth so we can keep getting what we want without having to deal with their reactions. We want to have our cake and eat it too. (I’ve never fully understood that expression – if you have your cake, shouldn’t you just eat it? Isn’t that what cake is for?). I have an Asian friend who told me the Chinese version of that expression is “Can’t have cake and pie.” That makes much more sense to me. I’m still learning to be truthful. 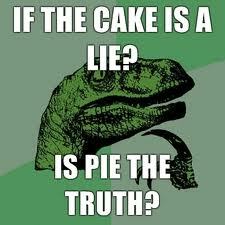 I realize though, that when I want pie as well as cake, and need to sneak into the refrigerator in the middle of the night when no one is looking to have it, I am not being truthful. If someone would be disapproving to know that I am eating pie, and I don’t want to experience that disapproval, then I must be uncomfortable with the truth of the situation. I am not accepting the Reality Flavor of the Day – Double Layer Mint Chocolate Disapproval. Wanting to have no rationing of health care (cake), yet not wanting to pay for the high cost of health insurance (pie). 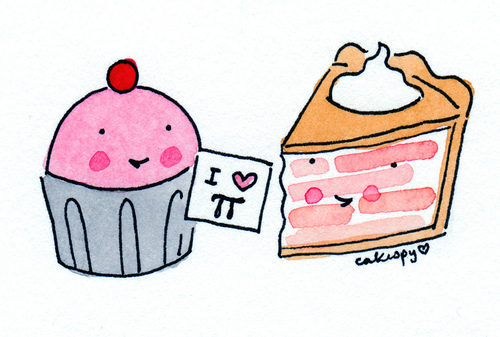 If we are wanting cake and pie, yet afraid of losing our cake by eating pie, then there may be something unresolved in us that makes us feel like we are entitled to both. We also simply turn a blind eye, neglecting to look at the consequences of our actions in order to secure exactly what we want. Care to meet up and discuss all this over a little Carrot Cake Pecan Pie Double Decadent Cake/Pie Combo desert? It’ll be our little secret.